This area, located along the southern shore of Wolf Bay, was the original 'Downtown' of Orange Beach. Beginning in the 1870's, the two schooners of James C. Callaway anchored near here in the deep-water Boat Basin. The schooners were used for importing supplies and exporting products like oranges, shingles or turpentine sap. They later serviced the lighthouse beacons in the Gulf of Mexico. In 1909, D.R. Peteet bought 3,254 асres here he called Gulf Bay Tract. He built a shingle mill near the community's vital wharf. A school was built here in 1910. It was used on alternating Sundays by the Baptist and Presbyterian congregations until 1953 when both built churches nearby. The Schoolhouse also served as a community meeting place. In 1954, the Home Demonstration Club began their annual 'Community Picnic' on the school grounds. By 1959, they had raised enough money to buy land for the Community Center now located one mile east of here. 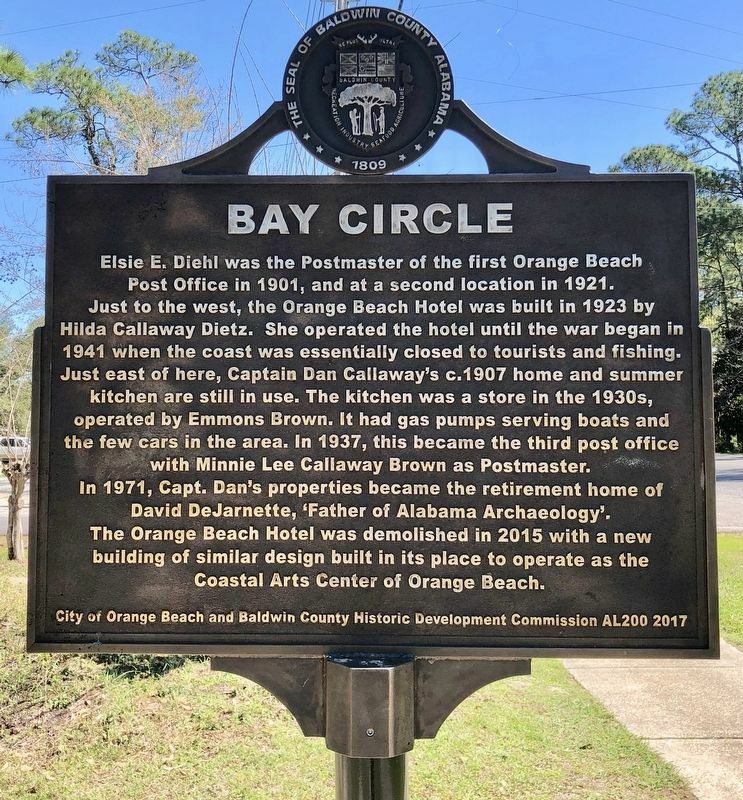 the Orange Beach Hotel was built in 1923 by Hilda Callaway Dietz. She operated the hotel until the war began in 1941 when the coast was essentially closed to tourists and fishing. Just east of here, Captain Dan Callaway's c.1907 home and summer kitchen are still in use. The kitchen was a store in the 1930s, operated by Emmons Brown. It had gas pumps serving boats and the few cars in the area. In 1937, this became the third post office with Minnie Lee Callaway Brown as Postmaster. In 1971, Capt. Dan's properties became the retirement home of David DeJarnette, 'Father of Alabama Archaeology'. The Orange Beach Hotel was demolished in 2015 with a new building of similar design built in its place to operate as the Coastal Arts Center of Orange Beach. 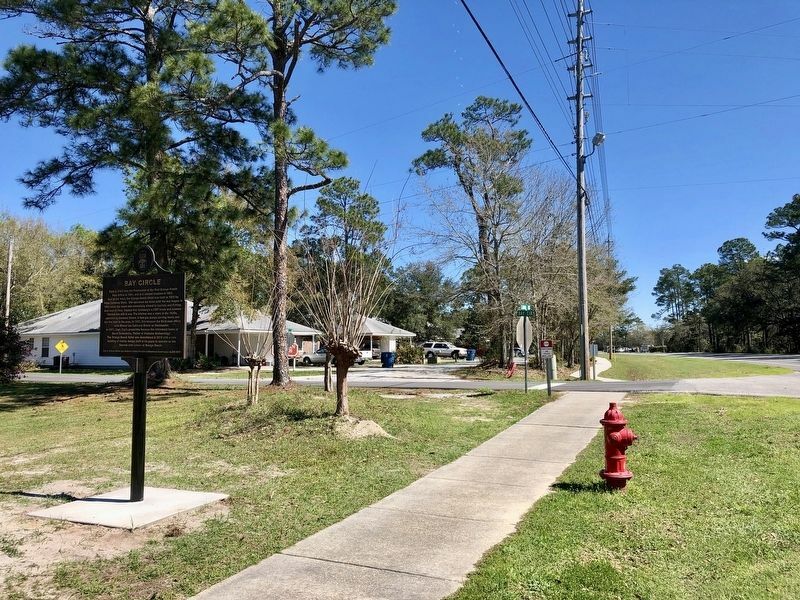 Erected 2019 by the City of Orange Beach and the Baldwin County Historic Development Commission AL200. Location. 30° 17.539′ N, 87° 34.391′ W. Marker is in Orange Beach, Alabama, in Baldwin County. 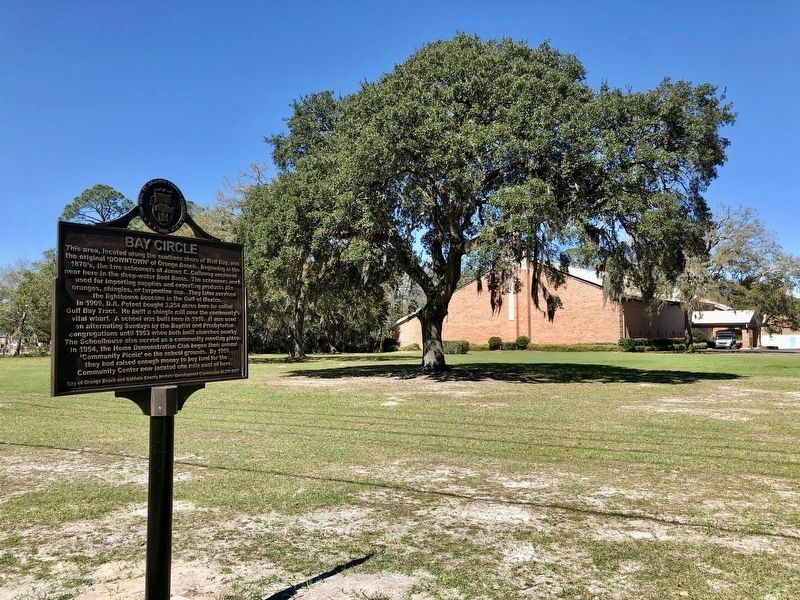 Marker is at the intersection of Canal Road and Bay Circle, on the right when traveling west on Canal Road. Touch for map. Marker is at or near this postal address: 4773 Bay Circle, Orange Beach AL 36561, United States of America. Touch for directions. 3. Bay Circle Marker looking east on Canal Road. (approx. ¾ mile away); Perdido Pass (approx. 1½ miles away); Orange Beach Community Cemetery (approx. 3 miles away); Josephine (approx. 3.3 miles away); Romar Beach (approx. 3.7 miles away); Daphne United Methodist Church (approx. 5½ miles away); Gulf Shores Community (approx. 7.6 miles away). 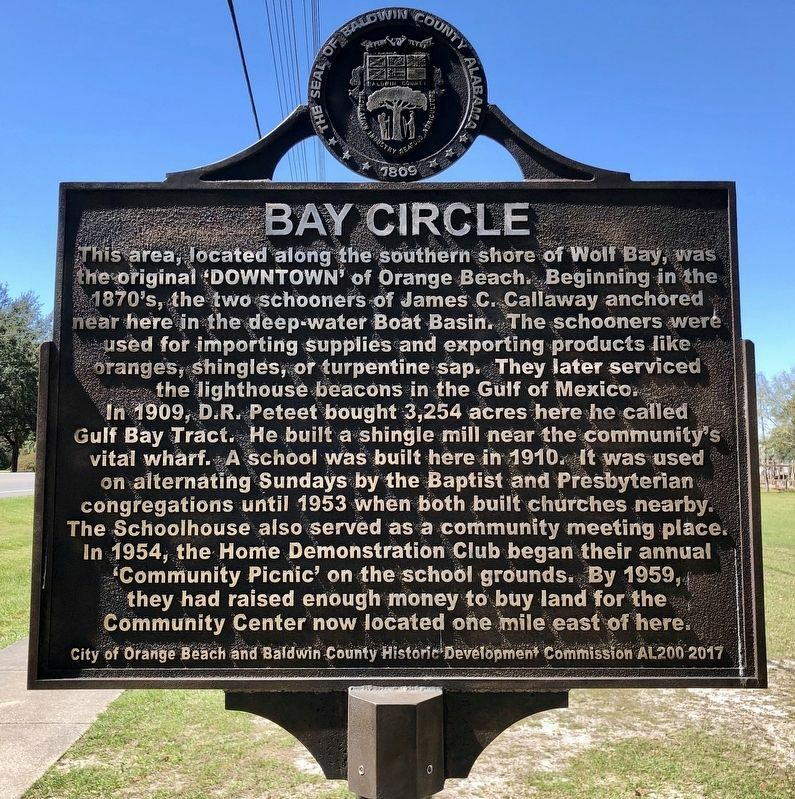 Touch for a list and map of all markers in Orange Beach. 4. View from marker northerly towards the Orange Beach Community Church. More. Search the internet for Bay Circle. Credits. This page was last revised on March 7, 2019. This page originally submitted on March 7, 2019, by Mark Hilton of Montgomery, Alabama. This page has been viewed 84 times since then. Photos: 1, 2, 3, 4. submitted on March 7, 2019, by Mark Hilton of Montgomery, Alabama.